Kathryn and Dennis are both native Tennesseans. They first came to M'boro courtesy the army in 1981 when Dennis was assigned to the Military Science Department at MTSU. The Gailbreaths moved to Lascassas in 1995 and have been here since. They decided about 10 years ago to downsize, live more simply, and become more self sufficient. During that process, Kathryn became interested in herbs and herbals, and began to experiment with her own concoctions. The couple then began building a personal library and sourcing materials and ingredients. In the background was the backbreaking work of clearing land, establishing a garden, building raised beds, getting a chicken flock established, building a cold frame, acquiring tools and skills, attending Master Gardener training...you know the drill; not exactly an overnight process. Although it was not part of their original vision, the Lascassas Farmers Market is an extension of all that, and they do enjoy sharing what they have learned. 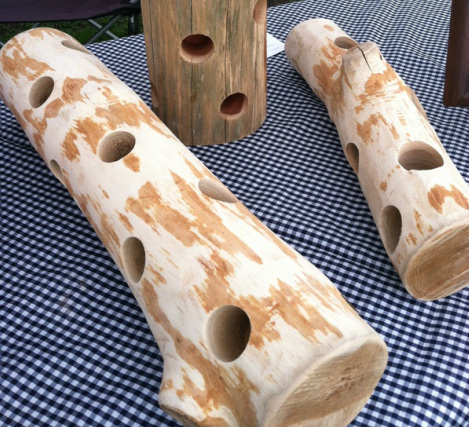 Dennis's wood products will be rustic-primitive with a function-before-form philosophy. They will carry bird feeders, occasional bird houses, trivets, an occasional piece for horse lovers, and whatever else moves Dennis.From time to time, they will feature rustic pieces done by their son. Most of the raw material is harvested on their property. Kathryn will be making candles, herbal salves, creams and ointments, and they will have a variety of fresh cut herbs in season. The Gailbreaths use what they make, and do not waste their time or money on things that don't work. This philosophy guides their offerings at the market.